Create a new table as users_information with below structure. insert some dumping data. This data will load our bootstrap model. create a new file as config.php then paste the copied below code inside the file. Load the query information to Bootstrap table. Convert users information to Jquery data value. Load the ajax() and jquery functions. Fetch the query for all inserted records in the user's information table with name Ascending order. var page_0 - load the users with JSON format this data will load bootstrap model. Here I have used the same form for add and edit. So, I have called same class .model_form in add /edit icon it will load the bootstrap model. <a data="<?php echo  $users->id ?>" title="Delete <?php echo $users->name;?>"
After insert/update the record, Session message display success or failure message. 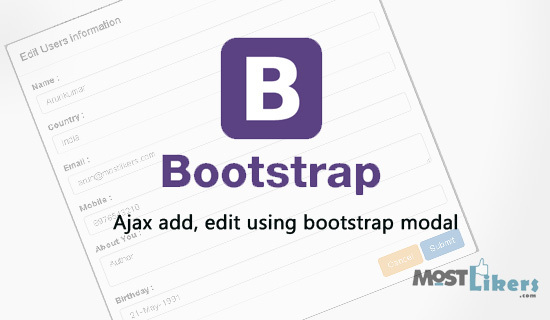 Bootstrap model form model copy and paste this code to index.php file. This model design won't visible until to call the jquery function. Create a new file called as add_edit.php After the ajax() call users information form data post to this page. I have hope this tutorial helpful for you. Share your feedback and comments. We are missied used few lines. Now $db->real_escape_string($id), You can use this code it's safe. Other than any security issues tel with us, We will update ASAP.